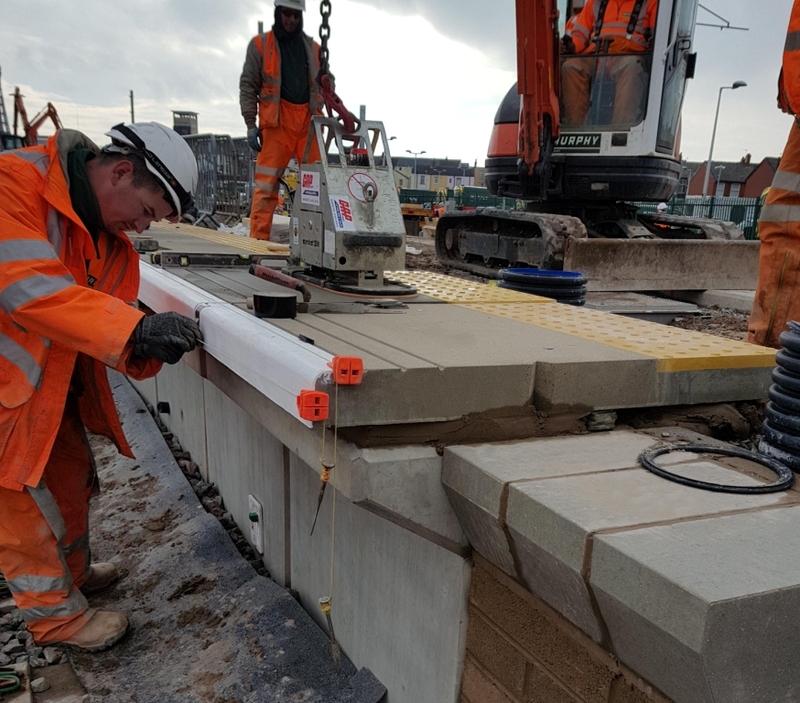 FP McCann has supplied over 2000 precast concrete dual rail copings as part of Network Rail’s Great North Rail electrification programme, which is designed to improve journeys between Blackpool and Preston and across the north of England. The large package of works includes major platform new build, extensions and refurbishment at Blackpool North and Kirkham and Wesham stations. The construction consortium on the project includes Volker Rail and Siemens. 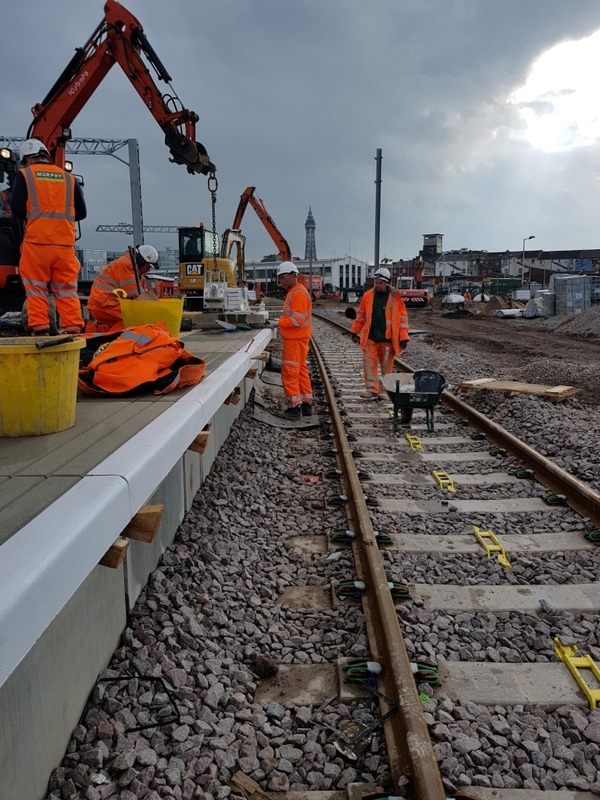 Working on behalf of Volker Rail at both Kirkham and Wesham and Blackpool North is J Murphy and Sons, whose teams are responsible for platform and footbridge construction, drainage civils and upgraded M&E at both stations. Blackpool North is nearing completion where platforms 1 to 8 have been demolished and replaced with 6 new, remodelled platforms totalling 1.69 km. The line at Kirkham and Wesham was reopened to the public on 29th January after the complete refurbishment of platforms 1 and 2, each measuring 185 metres long, and the construction of a brand new platform 3 measuring 200 metres long. Integral to the speed of the platform work has been the adoption of FP McCann’s unique precast concrete dual coping/ tactile system as tight construction schedules have been placed on the consortium. A conventional platform surface build typically requires a separate tactile slab to be bedded and jointed behind the coping. As a single precast concrete coping unit combining the tactile slab, significant time is saved as this process is eliminated. In particularly harsh winter conditions, the dual coping offers major benefits as it removes the need for jointing and the single precast slab can be quickly installed, reducing the time bedding compounds are exposed to the elements. The dual coping/tactile units are manufactured at FP McCann’s Littleport factory in full accordance with the requirements of NR/L3/ CIV/030 and are accredited as conforming to the pendulum test slip resistance requirements of BS EN 13036-4. For more information on FP McCann’s rail solutions, call our Littleport sales team on 01353 861416 or email sales@fpmccann.co.uk.